Spirited, courageous, always dependable and friendly, and never timid or aggressive. The gentle giant. The Apollo of dogs. The Great Dane. By whatever name you call it, this very large breed is instantly recognizable and can be very imposing to those who don’t know that its big body holds a huge capacity for loving its people. But what does owning a Great Dane really mean when it comes to both his size and his other traits? Read on to find out if owning one is a good fit for you. They’re named after a country from which they did not originate. They are shockingly good at apartment living. Sadly, their lifespan is often on the shorter side. Number one health concern for the breed is bloat. Pay attention to their diet. Great Danes are great with kids. They only need longer exercise once a day. Danes are pretty pricey puppies. They are an old breed. Early obedience training is key. Great Danes are one of the biggest dog breeds in the world, and their standard measurements back that up. Adult males weigh in at 140-175 and measure 30-32 inches tall. Their female counterparts can weigh 110-140 and stand 28-30 inches tall. Lucy is eight years old and weighs 108 pounds. When she stands on her hind legs, she is over six feet tall, large enough to put her front legs (not just her paws) on the shoulders of her male owner, who stands 6’3”. Like the poodle, which has its origins in Germany but is mostly associated with France, no one knows how the Great Dane, which also originated in Germany, came to be associated with Denmark. In Germany, they are called “Deutsche Dog,” which translates to “German Dog,” but everywhere else in the world, they are called Danes. Germans used to use them to hunt wild boars, but over the years they have become domesticated and now more likely to be found guarding their owners rather than fetching food for them to eat. They want to be with you all the time. They are highly trainable, especially with treats, and they will often be so eager to be near you that they forget just how big they are. Lucy did something bad and she knew it – she just couldn’t find a good space to hide that would accommodate her size. So she settled for trying to hide behind a curtain. Generally, the smaller the living space is that a person has, the smaller the breed of dog they should consider owning. The Great Dane does not fit that mold. For its huge size, it’s actually really good at apartment living. It doesn’t need a ton of exercise beyond a daily walk, and is content to become a couch potato. This dog looks imposing, but is typically very mellow. Lucy is content to sit on the edge of the ottoman. She doesn’t need her own dog bed or space in the house. She sits where – and how – her people do. Because of their size, they are susceptible to a variety of health problems that can shorten the number of years they have with you. Enlarged hearts, thyroid problems, hip dysplasia, bloat, and osteoarthritis are some of the issues that have been known to affect this breed. Lucy is eight years old, which means that she is a senior and is likely towards the end of her life based on the average amount of years that a Great Dane lives. Bloat is a condition where the stomach distends and twists, making it impossible for the food to pass through and slowly starving the dog. One way to combat this is a surgical procedure called a gastropexy, the attachment of the stomach lining to the abdominal wall. This can decrease the occurrence of bloat by up to 29 times in Great Danes. It’s usually performed in conjunction with the dog being spayed or neutered so there is no additional surgery required. There is no surefire way to prevent bloat outside of the surgical procedure, and vets aren’t completely sure what causes it. Generally eating smaller meals throughout the day and not exercising immediately after eating will help to minimalize the threat of bloat, but it will not eradicate it altogether. While all dogs should be given high-quality food, it’s especially important for a breed like this with potential stomach issues to be given really good food. And considering how much these large dogs can eat, you’ll want to make sure that you can afford the cost of food as part of your decision whether or not to own one of these dogs. Their temperament, personality, and love of people make them great companions for kids and adults. You’ll just need to provide plenty of supervision when your Dane is around your kids. As we mentioned, he doesn’t always realize just how big he is and might inadvertently knock a small child down while playing. Lucy loves her kid siblings, and they love her right back even though she is just about the same size that they are. Like most breeds, this one needs one longer run or walk per day. But the rest of the time they are very content to be lazy and lounge around on your sofa or even your bed. If you don’t have time for the long walk, make sure that you have a fenced-in yard. Despite the fact that they could probably easily scale it, Great Danes aren’t known to be jumpers so a regular six-foot high fence should be enough to keep them enclosed. Lucy likes to run, and her owners let her go every once in a while so she can get her energy out. She is really fast and can cover ground quickly and easily with her long legs. She always comes right back though. They only rarely require baths and their shedding is pretty minimal considering their size. Like a lot of other breeds, they shed more during the spring and fall, but a simple brushing will take care of the extra fur. These big dogs can come with big price tags. The average is around $1,200 per purebred puppy, but the price can easily reach just under $2,000. And make sure you ask about cropping. Most breeders will do that, but it will likely cost you extra. Lucy was one of 13 siblings. She is in this group with nine of them. 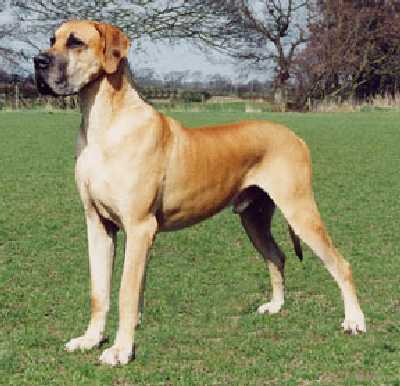 The Great Dane as we know it today has been around for at least 400 years. However, written descriptions of dogs that closely resemble the breed have been around for thousands of years. The earliest writing that details a dog similar to a Dane dates back to China in 1121 B.C. As we’ve said, the size of this dog’s heart matches the size of her body. But because that body will get to be so large, you’ll want to make sure you have early obedience training. Teach her when she’s young that you are her person and she needs to obey. That way she will be much easier to manage as she grows, despite the fact that she might one day be larger than you when she stands up. The Great Dane is a huge dog with an even bigger heart. If you’re ready for a dog that will love you unconditionally and be your shadow – despite his imposing size – then consider becoming a pet parent to this incredible dog. Search and adopt a Great Dane near you.